Shu Uemura Ultimate Remedy Duo-Serum is the miracle product for damaged hair. The revolutionary dual chamber dispenser includes a cream with Ceramide 2000 ppm, and a serum with a rich Lotus Infusion to keep hair fibers sealed and protected. This is the ultimate finishing product that provides anti-frizz, high-shine, all-day protection. Apply to styled hair working through ends and dry-prone areas. Posted in Products and tagged duo serum, finishing product, hair, hair products, shine, shu uemura, ultimate remedy on 2014/02/28 by josephbartucci. 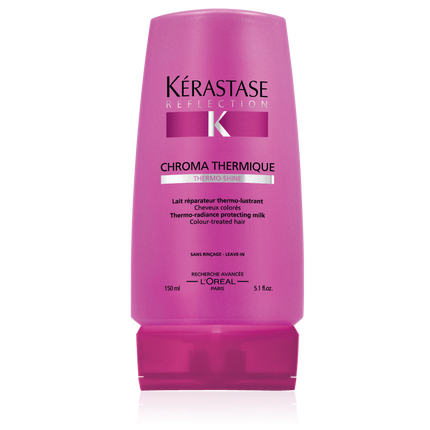 Kerastase Chroma Thermique is by far the best heat activated leave-in product for color-treated hair. A triple-threat product that smooths, protects, and adds amazing shine without weighing hair down. Add to towel dried hair starting at the ends and working upward, then style with heat as usual. Posted in Products and tagged chroma thermique, color treated, hair products, heat activated, kerastase, styling on 2014/02/06 by josephbartucci.